While other parking options exist, the Fletcher Parking Structure connects directly to the U-M School of Dentistry - making it the best choice for parking. 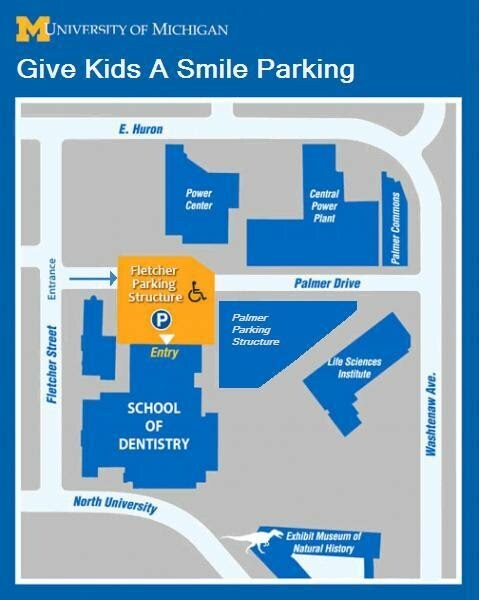 Plus on the day of Give Kids A Smile® (GKAS) parking will be free in this parking structure. To enter the parking structure off of Fletcher Street, go up the ramp on the left and take a parking ticket from the machine. At the end of the day, approach the gate on right and motion sensors will raise the gate.